Showing results for tags 'potters choice'. 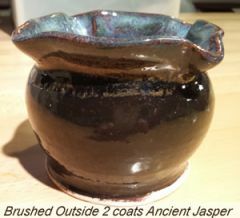 This bowl was fired at cone 4 and brushed with 2 coats of Potter's Choice glazes Blue Rutile (inside) & Ancient Jasper (outside) to cone 06 in a reduction kiln. 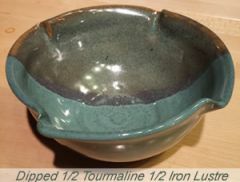 This bowl was fired at cone 4 and glazed with Potter's Choice glazes Tourmoline & Iron Lustre to cone 06 in a reduction kiln.